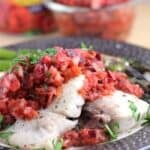 Fresh, grilled mahi mahi fish, topped with a kicked up cherry chipotle salsa made using fire-roasted tomatoes and garlic. 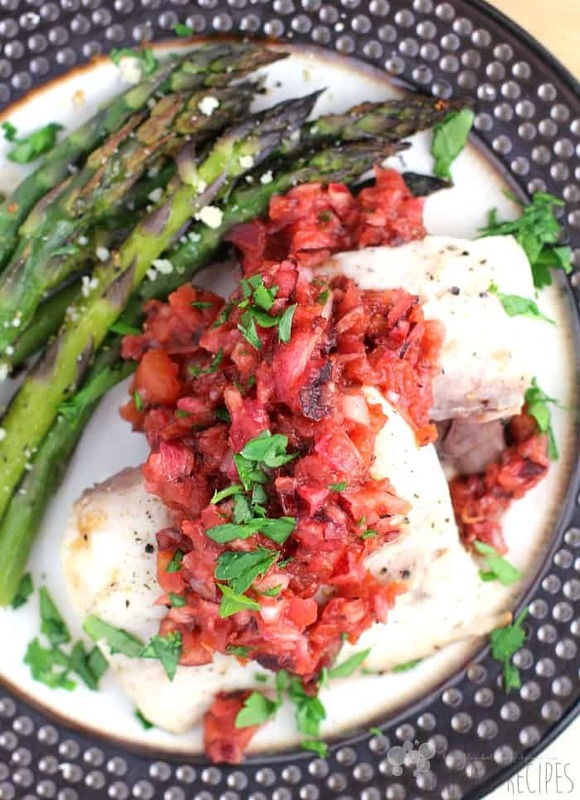 Ready in minutes, this easy, healthy Grilled Mahi Mahi with Cherry Chipotle Salsa dinner is summer perfect. Alright, I’m going to gush for a minute, because this dinner – this light and tasty, beautiful dinner – is so awesome. This healthy healthy dinner is ready super duper fast. Perfect for a weeknight. Or for a lazy warm spring weekend. It is just that perfect. Crazy perfect. This salsa is everything. It is sweet but balanced with a little kick. Crazy crazy tasty and sooo simple to make. 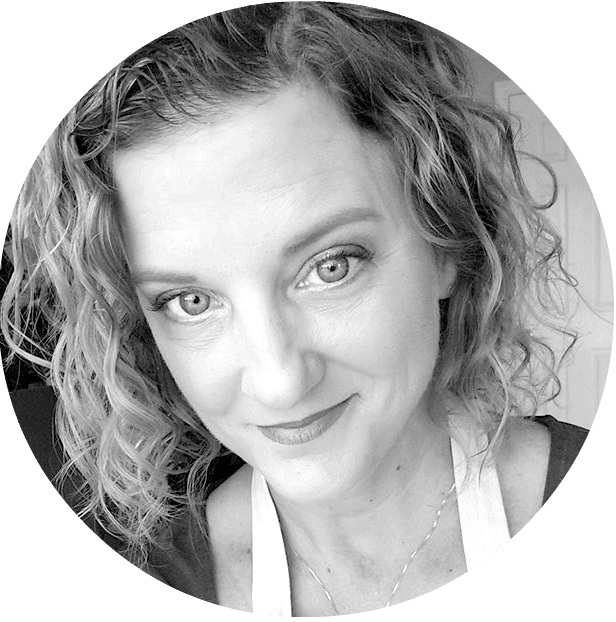 All we have to do is throw just a couple ingredients in the food processor. Pulse, pulse, pulse, and it is ready. This salsa is my new favorite. I am generally not a big fruit salsa fan – you’ll never get a mango salsa out of me. Mango belongs in smoothies not on fish as far as I am concerned. 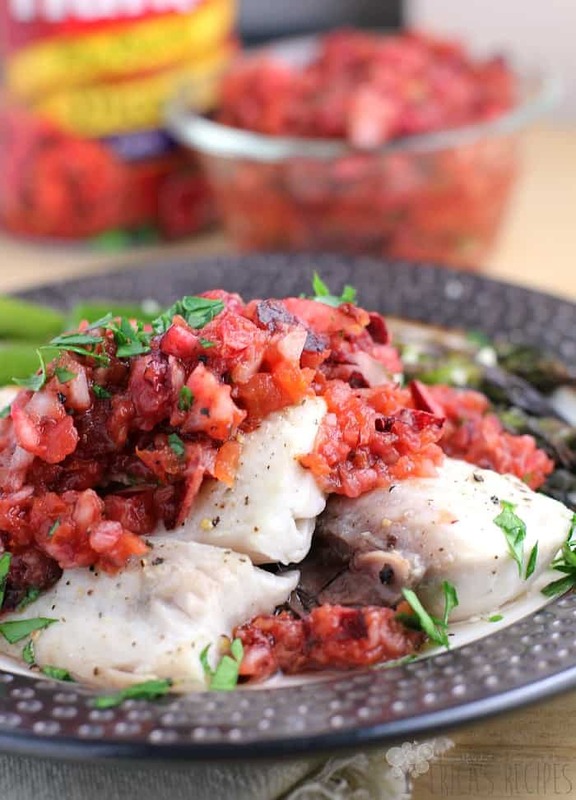 I did make a pineapple salsa for Coconut Cod – and that was stellar in that dish. But this is not territory I venture into very often. Guys, hands down this is the best salsa I have ever had. Definitively the best salsa I have ever made. It is that good. I can see this salsa going on almost anything off the grill – pork, chicken, fish. I chose mahi just because the other day, Mother’s Day actually, we traveled to Clearwater, FL, and went to the marine aquarium there. If you have seen the movie Dolphin Tale, then you know the aquarium where a dolphin named Winter lives – I have a huge soft spot/obsession with dolphins …but anywayyy, we went to lunch and I had the most delicious grilled mahi fish sandwich. So I had mahi mahi on the brain. Sometimes folks, it really just gets that little thought. I live in Florida, and mahi is a local catch. Any other fish that grills well, like salmon, swordfish, grouper, would be great with this salsa too. So go local. With fish – always go local. I had plenty of salsa leftover, so a couple nights later, it went on grilled pork chops. Lordy that was so good too! And to answer the obvious question …chips? Yes, this salsa is delicious with just regular tortilla chips. That’s two minute party food right there. Boom. So here’s my simple, quick, healthy (have I mentioned healthy? ), ready-in-10-minutes dinner with just the bestest salsa everrrr. Seriously try this! Heat the grill on high heat. While the grill is heating, prepare the salsa. 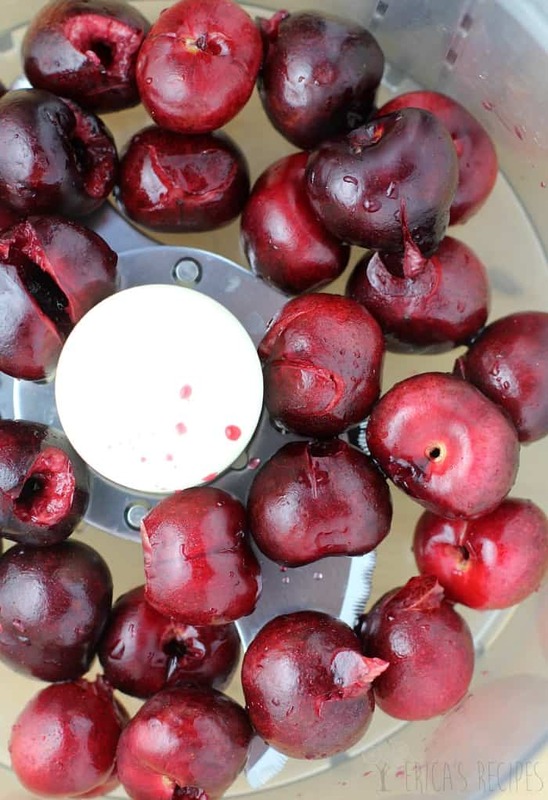 To a food processor, add the tomatoes, cherries, lime juice, chipotle pepper, and cumin, and a good pinch each of kosher salt and fresh cracked pepper. 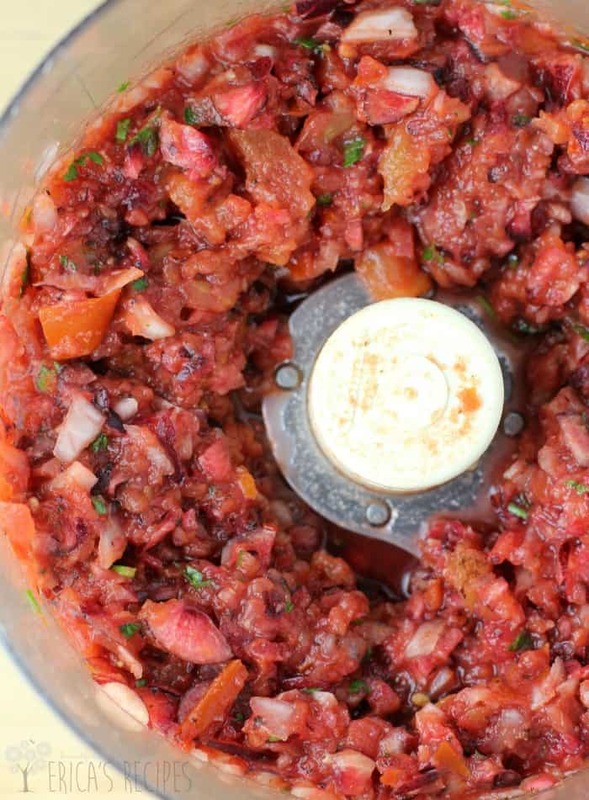 Pulse the food processor to combine and break the ingredients down a bit, but leave it chunky. Set aside. Season the fish with salt and pepper. Lay on a large piece of aluminum foil. Transfer the foil with the fish to the grill (I used a cookie sheet to transport the foil with the fish on it to the grill). 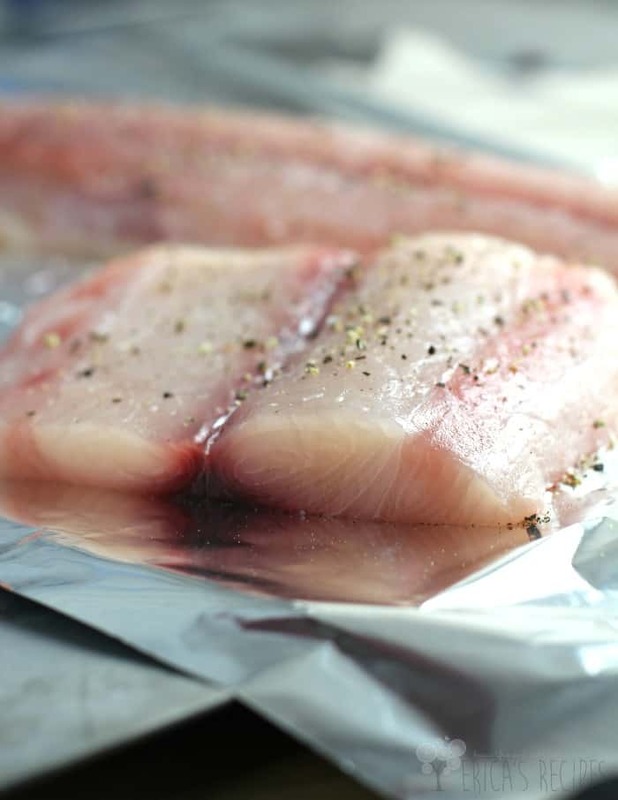 Grill 4-6 minutes until the fish flakes easily with a fork (cooking time will depend on the thickness of the fish). Serve immediately topped with Cherry Chipotle Salsa. Yields 4 servings. A little chipotle goes a long way. I used half a chipotle pepper when I made this. I thought the heat was just right; my husband thought it was a little hot to go with fish. So I recommend starting with 1/4 of a pepper and see how that works for you cuz you can always add more. 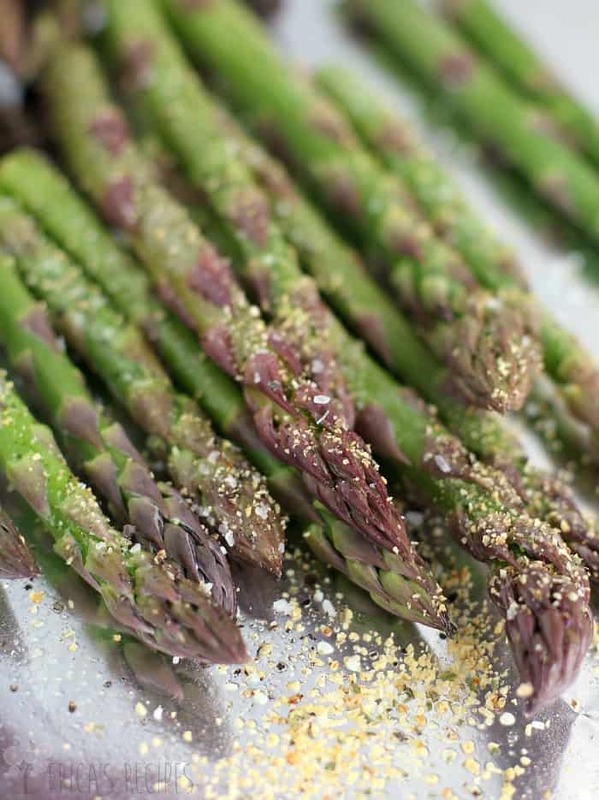 For the asparagus, I just took the spears, drizzled a little olive oil, seasoned with salt, pepper, and garlic and herb seasoning, and then put them in a foil pouch. Then I just threw that on the grill for 10 minutes. This sounds absolutely amazing Erica! We love grilled fish and this mahi mahi looks just perfect! Thanks for sharing!! How wonderful this recipe is and I can only imagine how tasty too! Looks great and I am sure the cherry chipotle salsa tastes great! Cherries are probably my favorite fruit (well, and peaches!). I love that you added chipotle to them to make a sauce. Smoky, sweet, tart, yum! I must try this. Pinning to make later. Thanks. Erica, this is one seriously “drool-worthy” dish my friend! The flavor profile you chose is absolutely tantalizing! This looks absolutely delicious Erica and the perfect entertaining dish! Pinned and shared! This sounds really lovely! Love the sound of the salsa, bet it pairs wonderfully with the fish! I love adding fruits to savory dishes! This looks scrumptious! Pinned and stumbled!